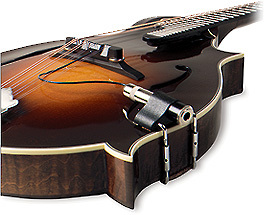 This well-known Massachusetts company offers two mandolin pickups: the mono M-100 and the stereo M-200, into which a microphone can be wired. Both are piezo elements embedded into Loar-style bridge saddles. To find out more, check out the Fishman Web site.